C. Kodeswaran was a Tamil officer in Ceylon’s clerical service, whose salary increment of Rs 10/= per month was suspended in April 1962. This was because he did not appear for a Sinhalese test which he was required to pass in accordance with a treasury circular of December 1961. The latter was issued in connection with implementing the Sinhala Only Act. 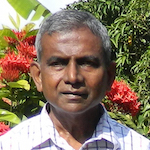 Kodeswaran filed action before the Colombo District Court contending that his rights under Section 29 of the (Soulbury) Constitution were being violated. Section 29 provided that Parliament could not enact any legislation which makes persons of any community or religion liable to disabilities or restrictions to which persons of other communities or religions are not made liable, and similarly for privileges and advantages. For example, one consequence of Sinhala Only was that a Sinhalese officer was exempted from learning Tamil to work in the largely Tamil- speaking North-East, while a Tamil officer generally functioning in his own language in the North-East was forced to learn Sinhalese. The case under Section 29 was quite clear. In order to avoid an awkward hearing on the validity of the Sinhala Only Act, the Attorney General raised a preliminary objection, viz., that a public servant was not entitled to sue the Crown (i.e. the State) for arrears of salary. O.L. de Kretzer who was then district judge, over-ruled the preliminary objection. de Kretzer also ruled in favour of Kodeswaran on the incompatibility of the Sinhala Only Act and Section 29, deeming the Act bad in law. The arguments will become evident in what follows. Shortly after the judgement was delivered in 1964, the Attorney General appealed against it at the Supreme Court. The case was argued before a bench comprising Chief Justice H.N.G. Fernando and Justice G.P.A. Silva. The team for the Crown (Defendent – Appellant) was led by Walter Jayawardena QC, Acting Attorney General, who was assisted by H. Deheragoda and H.L. de Silva. The team for Kodeswaran (Plaintiff-Respondent) was led by C. Ranganathan QC. The verdict was delivered in 1967 by H.N.G. Fernando CJ, setting aside the verdict and decree of the District Court (70 NLR 121). The arguments used are instructive and involved two stages. Four years after capturing the maritime provinces of Ceylon from the Dutch, the British Crown declared by Royal Proclamation in 1799, that the system of justice in Ceylon will revert back to that which prevailed under the government of the United Provinces (i.e. the Netherlands). This provision was extended to the whole island in 1835. This meant that the Roman-Dutch Law was to be the basis for the common law in Ceylon. (By an almost contemporaneous proclamation, the Roman- Dutch Law was also made applicable to South Africa – then the Cape Colony.) The proclamation with regard to Ceylon made references to ‘ministerial officers’ and ‘institutions’ (of civil administration). Under the Dutch administration, the relationship between the government and government servants possessed the legal characteristics of a contract of service, thus enabling the latter to sue the former for arrears of salary. As the first stage of the judgement, it was concluded by Fernando CJ that the Proclamation of 1799 under the Governor, Lord North, did not intend to cover relations between the Crown and persons employed by the Crown. It was thus determined that these relations are covered by English common law, rather than Roman-Dutch Law. It was held in this connection by Fernando CJ that the Privy Council judgement of 1884 in the case of Simon Appu v. Queen’s Advocate for breach of contract, had set aside the precedents which favoured the Roman-Dutch Law. This was not quite the position. A short time before Simon Appu’s case there was heard before the Supreme Court the case of Jayawardena v. Queen’s Advocate. Both these concerned breach of contract rather than arrears of salary. In answering this question with regard to Simon Appu’s case, the Judicial Committee of the Privy Council, on the basis of the knowledge at their disposal, were unable to decide with certainty that the practice of suing the Crown in Ceylon was founded on Roman-Dutch antecedents. But finding that the legislature (in Ceylon) has recognised and made provision for such suits at least twenty-eight years ago, the Privy Council held that “they are now incorporated into the law of the land”. The correctness of the right to sue the Crown in Ceylon had thus been admitted. The Supreme Court in its judgement in Kodeswaran’s case played down the last conclusion of the Privy Council above (in 1884), and used mainly its inability to find conclusive antecedents in Roman-Dutch Law. Fernando CJ thus concluded that Kodeswaran’s right to sue the crown must be determined under English common law. Having come to this point, the Supreme Court went into the second stage of considering an Indian case, since English common law, unlike in Ceylon, was the basis for the common law in India. The case in question was that of High Commissioner for India v. Lall that was heard before the Privy Council in 1948. Lall had been a civil servant who appealed against wrongful dismissal and sued for arrears of salary. The Privy Council in Lall’s case relied also on the judgement in Mulvenna v. The Admiralty heard before the Scottish Court of Session in 1926. The Privy Council declared Mr. Lall’s dismissal void (and thus reinstated him), but also that he had no right of action for arrears of pay. The same was held by Fernando CJ to apply to Kodeswaran. The Supreme Court thus set aside the District Court’s judgement on this preliminary issue. H.N.G. Fernando CJ stated in his judgement that he had not called upon the Acting Attorney General to submit his arguments on the Sinhala Only Act, since the action had been decided on a point of a general law. Kodeswaran appealed to the Privy Council in 1968 (72 NLR 337) and the case was heard before Lord Hodson, Viscount Dilhorne, Lord Pearson and Lord Diplock. Among those representing Kodeswaran were Sir Dingle Foot QC, Ranganathan QC and S.C. Crossette- Thambiah. Among those representing the Attorney General were E.F.N. Gratiaen QC and H.L. de Silva. The judgement of the Privy Council was delivered by Lord Diplock on 11th December 1969, on the eve of the 1970 general elections, setting aside the Supreme Court judgement on the preliminary issue. (i) The Proclamation marked the re- introduction of the system of administration by local officials that had prevailed under the Dutch, the abolition of which, after the capture of Colombo and Trincomalee by the British East India Company had led to rebellion in 1797. (ii) The British occupation was then (in 1799) deemed temporary. This was so until Holland ceded Ceylon to Britain under the Treaty of Amiens in 1802. (iii) The legal character of a contract, which the Roman-Dutch Law ascribed to the relationship between the Crown and public servants in Ceylon, and recognised long in practice, had no incompatibility with the rights and dignities of the sovereign. 2 ) The current of authority in English public law since early in the 19th century is that the arrears of salary of a civil servant of the Crown constituted a debt recoverable by Petition of Right. Lall’s case on which the Supreme Court relied is not a good example because most of the argument in that case centered around the question of dismissal. Moreover, none of the pertinent earlier authorities on the question of recoverability of arrears was drawn to the attention of the Privy Council in Lall’s case. Mulvenna’s case of 1926 on which the judgement in Lall’s case relied for the question of arrears, has not since been treated as correctly laying down the Law, and Lord Blackburn’s judgement in that case did not have the concurrence of the other two judges. 3 ) While 1) and 2) above are interesting in themselves, the crucial question is what does the common law in Ceylon have to say on the subject? The right to sue the Crown upon a contract had long been “sanctioned by the Courts and acquiesced in by the Government”. When its propriety was questioned in Jaywardena’s case, it was Chief Justice Cayley’s contention that it was too late in the day for him to declare the practice bad in law. He added that if the precedents and decisions upon which this Court acts are wrong, it must be left to the Court of Appeal to set them right. However, when the Privy Council considered the question shortly afterwards in Simon Appu’s case in 1884, they declared the practice incorporated into the law of the land. “…we say that a true and proper obligation arises from a promise and contract of a king, which he has entered into with his subjects, and that this obligation confers a right upon his subjects…..” -De Jure Belli ac Pacis, Book Three. However, it may be difficult to trace the evolution of the practice of suing the Crown in Ceylon to the Roman-Dutch Law for a number of reasons. Combined with the paucity of records it had acquired the character of a “taken-for-granted” law. But the Roman-Dutch Law, which was the starting point of the common law in Ceylon, has been used over the years to find solutions to legal problems in Ceylon, resulting in the evolution of an indigenous common law. Thus if precedents for a proposition of law can be found in the decisions of the Ceylon courts themselves that are not inconsistent with the British constitutional concept of sovereign authority of the Crown, there is no need to look for precedents in English common law or to Dutch jurists of the 18th century. The Privy Council declined to comment on the other issues (e.g. the Sinhala Only Act) since neither they nor the Supreme Court had heard any arguments on these matters, and thought it inappropriate to comment without the considered opinion of the Supreme Court of Ceylon. Thus by means of a tortuous argument the hearing on the validity of the Sinhala Only Act was circumvented. This was achieved, by the Supreme Court granting to Queen Elizabeth II, a feudal right that had become void in England for more than a century. The ruling, apart from being contrary to natural justice, rendered the Law nebulous rather than transparent. With the case having been remitted by the Privy Council to the Supreme Court for a hearing on the validity of the Sinhala Only Act and the treasury circular, it should have got listed. We understand that it was not pursued by either side. One reason for it is that the treasury circular stopping the salary increments of those who did not pass the tests in Sinhalese had been amended in the mid-60s and all Tamil public servants received their arrears of salary. That was the time the Federal Party’s support was being canvassed by both the SLFP and the UNP. An important point is that the District Court’s ruling the Sinhala Only Act void, had not been challenged by the State whether at the Supreme Court or at the Privy Council. In this sense the Act remained void in law, although the State decided to ignore de Kretzer’s ruling at the District Court, giving a moral victory to those who were against the Act. It was left to the State to prove in a higher court that the Act was valid or to put its house in order. It chose to live with anarchy. Such an attitude worked towards debasing all aspects of the legal process. The relationship between the SLFP and the ITAK (alias FP) was strained badly since the Satyagraha and the FP was always with the UNP (and imperialism) to oppose all anti-imperialist legislation. The FP enabled (along with CPde Silva & Co who sold out to DR Wijewardena in 1964 and the idealistic but unwise LSSP rebels) the defeat of the bill to nationalize the Lake House in 1964 and theeby bring down the government. there was some power brokering to persuade the FP to back the SLFP government, which faled, and a deal was struck between the UNP and FP early in 1965. I wonder which period is referred to in which “the Federal Party’s support was being canvassed by both the SLFP and the UNP”. The SWRDB government got passed the ‘reasonable use of Tamil’ legislation the year before the assassination of SWRDB. I do not think that wooing the FP had something to do with everything that the governments had dome in support of Tamils. “if you mistreat them (Tamils), if you ill treat them…. if you oppress and harass them, in the process you may cause to emerge in Ceylon, from that particular racial stock with its own language and tradition, a new nationality to which we will have to concede more claims than it puts forward now… If we come to the stage where instead of parity, we through needless insularity, get into the position of suppressing the Tamil … federal demand… there may emerge separatism.” (Dr Colvin R. De Silva, Opposition Member of Parliament, Hansard, June 1956). The same Dr. Colvin R. De Silva after 15 years, accepted appointment as Minister of Constitutional Affairs in Mrs. Srimavo Bandaranaike’s government in 1970. “Mr. Chairman, there is a Unitary Constitution in Sri Lanka. This has been there for a very long time… If we were to divide the country and unite once again we will face many problems as evidenced by our history.. .. I submit this proposal for a Unitary Constitution for approval by all sections of this Assembly”. The 1972 republican constitution of Sri Lanka, which for the first time constitutionalized a unitary Sinhala-Buddhist state, was enacted without the participation or mandate of Sri Lankan Tamils. Sri Lankan Tamils were not a party and never accepted the one-sided constitution Sri Lanka enacted in 1972. Not only their political opposition was brushed aside but even the judiciary also played a game against legal challenges. When C. Suntharalingam waged legal battles in the island against the 1972 constitution, the courts played a game by first telling that they could not take up the case until the constitution is declared and thereafter telling that they could not act as they were bound by the constitution. The 1972 Constitution abolished the Soulbury safeguards for minorities, entrenched Sinhala as the sole official language, conferred pre-eminence on Buddhism (as DS Senanayake had declined to), and made explicit the unitary character of the state (which the Soulbury Constitution remained silent on). The Constitution making process of ’72 ignored the moderate (non-federal) six point platform presented in Mr. Chelvanayagam’s letter to the PM, which was not even accorded the courtesy of a reply. The Amirthalingam trial-at-bar involving the 1972 constitution in which 64 lawyers argued for Mr. A. Amirthalingam who was tried under Emergency Regulations by the Sri Lankan state, it was none other than Murugesu Thiruchelvam, Dr. Neelan Thiruchelvam’s father, who actually took up the argument that the 1972 constitution was invalid or could not be applied to Tamils. There was yet another side of the legal battles in which the Privy Council that had some responsibility and Britain that was the root cause for the evil of the unitary state in the island, also have failed the Sri Lankan Tamils. A couple of days before its proclamation in Colombo, the draft of the 1972 Constitution was burnt by the Ilangkai Thamizh Arasuk Kadchi (ITAK) leader SJV Chelvanayakam and others, including Mr. Amirthalingam, at the Arumuga Navalar Ashramam Hall at Neeraaviyadi in Jaffna in May 1972. On the other hand, in 1972, dozens of Tamil youth were arrested and incarcerated for putting up black flags. Those arrests in 1972 did not help stabilize the situation but it created the Tamil militancy, it created the TNT (Tamil New Tigers) and Prabakaran. The 1972 constitution was the progenitor for the rise of all shades of armed Tamil militancy. It should be noted that in the same year 1972, the Tamil New Tigers (TNT) was formed by Prabhakaran. The 1972 constitution made even the moderate Tamil political leaders to abandon the demand for federalism and to go for a separate state solution. To prove Tamil opinion rejecting the 1972 constitution, SJV Chelva resigned his parliamentary seat and won a by-election. The Tamil United Front (TUF) was formed in May 1972. This became the TULF in May 1976. After leading the most favored Tamil political party and struggling for federal solution for more than 25 years that found no success with Sinhala leadership, SJV Chelva ultimately presided over the Vaddukkoaddai Resolution that called for Tamil independence (separate state) in 1976. Dr. Colvin R. De Silva, who once professed the famous dictum “one language two nations, two languages one nation” made the Tamil people second class citizens through the 1972 constitution of which he was the architect. By introducing the 1972 Republican Constitution, it was the Sinhalese leadership, and no one else, who are to blame for inspiring the Tamil regional majority to officially demand a separate Tamil state (Tamil Eelam) in 1977. This was further influenced by their denial of equal rights (It robbed the minorities of even the scanty safeguards against discrimination) under the law to the minorities, evidenced by their deliberate exclusion of the provisions of Section 29 of the Soulbury Constitution (introduced at independence in 1948). Para-Sinhala Only’ & Its Effects On Ceylon’s Legal Tradition, and Ignorance of Para-Tamils? Why? Majority Rule? No rights for minorities? After reading the series by Rajan, the Tamils were right in taking up arms. When justice is denied in the most blatant way, what else were the Tamils left with to defend themselves. SWRD Bandaranaike was the biggest traitor SL has ever seen with his 1956 sinhala-only act. 2nd biggest traitor would be JR Jayawardena for what happen in July 1983, not to mention the dictatorial constitution crafted by him in 1977/78. The UNP was the innovator of modern SL thuggery. Rajapaksha’s were mere adherents of this. Both SLFP and UNP wonderfully destroyed a once promising nation called “Ceylon”. If I remember the sequence correctly, the provision to appeal to the Privy Council was annulled and the the Senate, Was eliminated, soon after the Kodeswaran verdict and before the 1970 constitution was forced down our throats. Constitutions have been the toys our politicians played with since independence! This is Dr Nihal Jayawickrama’s area of expertise, but I had always thought that appeals to the Privy Councils were stopped mainly because the 1962 coup suspects (all Christians, and including some not-very-close relatives of mine) were allowed to go scot-free. I didn’t know much about the Kodeswaran verdict – and all this sounds dated. It is important to realise that Dr Rajan Hoole has not posted this article today. This is just his fourteen year old book getting serialised. I’m a Sinhalese who doesn’t know ANY Tamil; Rajan Hoole is a Tamil who has picked up enough Sinhalese owing to living in the South, and because Sinhala is the No. 1 language in Sri Lanka. Rajan can, I’m sure, pass any elementary Sinhala test, but can hardly be considered even “literate” in Sinhala. Neither Rajan nor I is a racist, and having had relatively privileged up-bringings can communicate effectively in English. The problem isn’t with us. I will live out the little of my life that is left without bothering to learn Tamil, but people like me ought to be given an increment at work if we learn a bit of Tamil. I think that that is what is now happening. Also, right now all Sinhalese children are taught a bit of Tamil in schools, starting in the primary – my guess is that it is about Grade 4, with English having started in Grade 3. Kids and teachers are happy with this; they find that their progress is much better with Tamil than with English – mainly because there is no “Kaduwa” factor. English teaching is taken much more seriously, however, and at least five times the time is spent on it, and even more times the resources. From the Sinhalese side this is enough! As I’ve indicated already, Sinhalese gets learnt more than that by Tamils. Don’t politicise any of this, and we’ll be all right, on language at least. A second house of parliament: I’m pretty sure that I’m out of my depth there! The business community in Jaffna can communicate in Sinhala quite well now. Many Tamil schools her have Sinhala teachers. Many Sinhala undergraduates are residing in Tamil homes and invite their fellow Tamil students and members of the families with whom they live to their homes in the South. This is slowly evolving process, but is in the right direction. The media portrays the extreme and not the norm. Further, it exaggerates the extreme and assigns interpretations that’ are figments of Its imaginatioN. There is very little investigative journalism in this country. The PM is beginning to challenge them. Freedom of the press does not imply the freedom of the donkey to bray day and night and disturb the neighborhood. We need facts reported and interpretations and comments must be based on indepth study and thinking. There is much hope around here, but hopelessness is being promoted more than hope. That is so, is saddening, considering what has transpired since independence. Narrow mindedness and bigotry have become deliberately cultivated virtues. Writing about the Jaffna University and the recent events there, Rajan Philips, writing in today’s Sunday Island says, ‘One does not know where the market place ends and the University begins’ . Very apt words that apply to all universities in this country. This is the sad situation in the country. Re your comment: The decision to abolish the right of appeal to the Privy Council and to establish a court of final appeal in Ceylon was taken shortly after the 1970 election on the initiative of the Ministry of Justice. It had no connection to the Kodeeswaran Case. Only about 5 per cent of the cases decided by the Supreme Court were being taken in appeal because the cost was exorbitant. Dr Colvin R de Silva would have preferred if the abolition of the right of appeal to the Queen coincided with the establishment of the republic, but I pointed out to him that the justice ministry had its own programme of reform and should be allowed to proceed with it. The abolition of the Senate resulted from its rejection of a Bill passed by the House of Representatives. That Bill sought to amend the Parliamentary Elections Order in Council to provide that a member of parliament became subject to disqualification only if he was convicted of an offence involving “moral turpitude”. I believe it was designed to help Nanda Ellawela. The hastily drafted defective Bill, presented immediately after the government was formed, was “smothered” in the Senate by Senator Nadesan and Senator Tiruchelvam. JRJ knew what the consequences would be, but he failed to persuade the UNP majority in the Senate led by A.F.Wijemanne to abstain. Colvin used the Kodeeswaran case as an argument for entrenching Sinhala in the Constitution, while Mrs Bandaranaike wrote to him saying she would prefer if the issue of language was not raised again. hurt the Tamils more than the Sinhalese – in the years following our becoming a Republic. The cause of justice in the country would have been served far better if we continued to have that right in spite of our Republican Status. Nonetheless, I appreciate Nihal J chosing to present his views. Dr. Rajan Hoole enriches all of us with his own research into this much debated matter. The Privy Council let the 1962 coup conspirators off the hook. The 1970s were great years for young[then] Nihal.J. He was Actg:Attorney General,Secy:Ministry of Justice etc etc.The whiz kid of Felix Dias! When Nihal Js uncle,that great judge Justice T.S.Fernando passed judgement at the conclusion of the Bandaranaike murder case,he told Somarama you have destroyed a true son of Lanka. If I remember right[I read this in the media],at a ceremonial sitting of the Supreme Court,presided over by the CJ.Justice Victor Tennekoon there was a bit of an incident.In the front row sat Felix Dias and by his side young Nihal.J. The silks[QCC] were in the Inner Bar.After the Judges mounted the Bench,the CJ looked around and told Nihal J.to take a seat in the back row.Perhaps,the Judges were peeved that a young buck[Nihal.J.must have been in his 30s then]should move up so rapidly. Political Patronage can do wonders! I say this without any malice whatsoever towards Dr.N.J.whom I have met personally in the UK.several years ago. His Legal commentaries on the CT WERE SUPERB READING.No doubt the Maturity that goes with Legal learning has moulded him. Was it Sir:Francis Bacon-The onetime Lord Chancellor who said that Youth and discretion are ill-wed companions? Incidentally,GLP and Dr.Nihal J.are married to two sisters.